Christmas cheer has arrived in the Winter Woodland as the animals get ready for some festive fun. A wonderful papercraft collection with a range of charming papers and embellishments for festive crafting, including new dies and embossing folders! Using stickers for the main image adds a simple but really effective touch to your projects. 1. Layer a piece of pinecone card, cut to 14 x 14cm, layer on dark green card leaving a 2mm border. 2. Cut the Christmas wreath paper to 11 x 11cm and again layer on dark green card, stick down on the centre of the card slightly on an angle. 3. Repeat the last step with the green festive strip paper cut to 14 x 4.5cm, wrap a length of red gingham ribbon around this card section and tie with a bow, glue down on the lower half on the card blank. 4. Build the Owl decoupage and mount on green card, mount on the card base matching the same angle as the wreath paper. 5. Die cut two trees out of brown card, use foam squares to stick one either side of the decoupage. Die cut 4 Christmas baubles and thread on a length of twine, tie to each end of the die cut tree. Using a bright card for layering adds a lovely bright look to your cards. 1. Build the Christmas tree decoupage and put to one side. 2. Cut a piece of star print paper to 14 x 14cm and layer on yellow textured card leaving a 2mm border. 3. Trim the robin print paper to 10.5 x 10.5 cm and layer on the yellow card, glue down on an angle. Cut a strip of tree print paper 4.5 x 14cm, layer on yellow card and wrap with the Happy Christmas ribbon finished with a bow, stick down. 4. Fix the decoupage to the front of the card and finish with a die cut bauble in the top corner , tied with some twine. 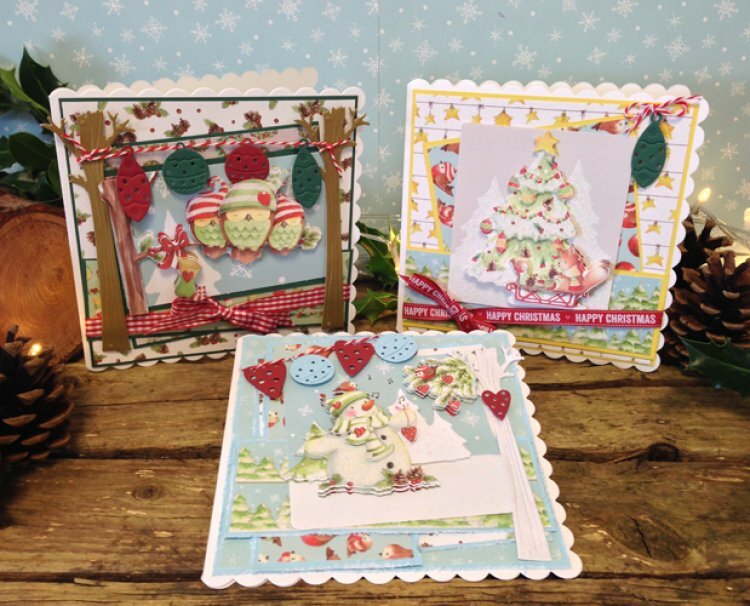 Add distressed edges to your Christmas cards to add a shabby chic vintage touch to your projects. 1.Cut a piece of glitter snowflake paper to 14 x 14cm and layer on some light blue card leaving a 2mm border, to distress the edges run your scissor blade along the edge of the card to give it a rough effect. 2.Trim the pinecone paper to 12x 12cm, layer on blue card and again distress the edges, glue to the first layer on a slight angle. 3.Cut the robin print paper to 6 x 13 cm and layer and distress as before, repeat this with the tree print paper trimmed to 5 x 13.5cm. Fix the layers to the card. 4.Build the Snowman decoupage and stick down on your card on a slight angle. 5.Die cut 2 heart shapes and 2 baubles, thread onto some twine and attach to the card like bunting in the top left corner. 6.Die cut a tree on white card and a small heart. Fix to the right of the decoupage, add glitter glue to the tree for a bit of sparkle. Finish by gluing the layout on a 6x6 scalloped card blank. We would love to receive one of these beautiful handmade cards for Christmas, show us your Christmas makes in the Trimcraft project gallery.